Stephen Reinstadtler posted a discussion to find out more about a painting in Nairn Museum once described as a depiction of the death of Louis Napoléon, Prince Imperial of France, who served with the Royal Artillery in the Zulu War, 1879. 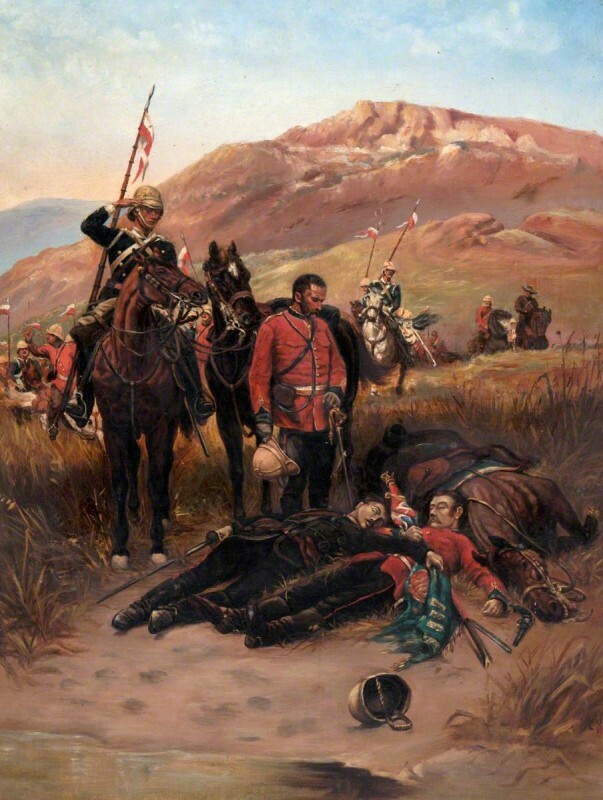 He thought the work did not depict the Battle of Isandhlwana, as previously thought, because it depicts troopers of the 17th Lancers (who were not present at Isandlwana). Julian Whybra confirmed the original description to be wrong, as the painting shows the discovery of the bodies of Lieutenant T. Melvill (in the red jacket), and Lieutenant N. Coghill (in the blue patrol jacket), both of the 1/24th (2nd Warwickshire) Regiment, who failed to escape from Isandhlwana. They managed to cross the Buffalo River into Natal, but were overtaken on the British side of the bank, as they tried to save the regimental colour. Their relatives received the posthumous Victoria Crosses in 1906 on their behalf. It seems the anachronistic depiction of the 17th Lancers confused matters; when the bodies were retrieved the Lancers had yet to leave England for South Africa. Peter Harrington said the painting is after The Last Sleep of the Brave by the nineteenth-century French military painter, Alphonse de Neuville, which along with Saving the Queen's Colours, was commissioned by J. G. Murdoch of the National Fine Art Association, and exhibited at Messrs Dowdeswell's Gallery in London during June 1882. Osmund Bullock mentioned an oleograph after the painting published in 1881, and Oliver Perry discovered an article with the same oleograph, plus additional journal references. Nairn Museum confirmed that they hold a version of Saving the Queen's Colours, for which the same question arises, and mentions the size of both originals. Reinstadtler and Bullock query these measurements and suggest tracing the family of the original buyer Robert Emmett Levitt in South Africa, for proof of the size. Reinstadtler later discover that the Museum of the Welsh Soldier, Cardiff Castle, holds a version of the same painting, but Oliver Perry commented that it looks closer to a chromolithograph. Andrew Greg recommended the painting be retitled The Last Sleep of the Brave and described as being ‘after’ Alphonse de Neuville (1835–1885). He also proposed the collection retitle and reattribute Saving the Queen's Colours at Nairn, and similarly proposed a discussion about the work at Cardiff Castle Museum of the Welsh soldier, to suggest that it is in fact a chromolithograph and not an oil painting. Does this painting depict the death of Napoléon, Prince Imperial of France?